« Don’t Forget to Backup SiteLINK too! 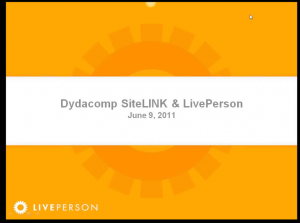 Added LivePerson to your SiteLINK eCommerce Store yet? •	Increase customer satisfaction rates by 85-90 percent. Click here to view the webinar on demand on the M.O.M. User Forum. For more information on how Live Chat can influence for your eCommerce store, check out this blog written by Al Pascale, Dydacomp eCommerce Manager. This entry was posted on Friday, June 17th, 2011 at 3:47 pm	and is filed under Dydacomp News, Ecommerce. You can follow any responses to this entry through the RSS 2.0 feed. You can skip to the end and leave a response. Pinging is currently not allowed.